from the Midwest to the East Coast. Welcome to DisplayWorks’ home in Cincinnati — your full-service connection to award-winning tradeshow exhibits, stunning corporate interiors and unique environments. Our 55,000 sq. ft. Cincinnati facility offers the perfect home base for Midwest and East Coast companies with North American or International exhibit programs. 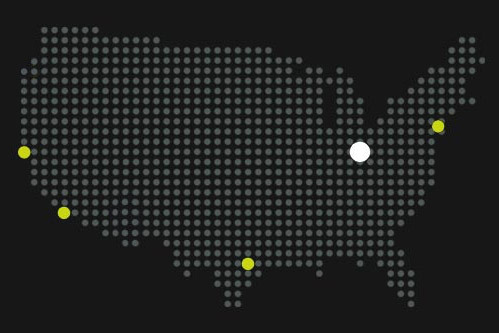 We provide strategic management, infrastructure and technology to support programs of virtually any size, anywhere — with design, fabrication, warehousing and fulfillment centers on both coasts and a network of partners overseas. New York, down to Dallas and Orlando, allows for cost-effective and efficient servicing of your exhibit programs throughout the Midwest and East Coast. DisplayWorks gives you experience where it counts with over 30 years in the industry. Call on us for your next project — we’re ready to work with you. Whether you need a custom tradeshow exhibit, a unique custom rental booth, or a flexible modular exhibit, our design and account teams collaborate with you to find the perfect exhibit fit to meet your needs — and your budget. Looking for that perfect corporate lobby, museum display or experience center? DisplayWorks specializes creating unique environments that can help communicate your brand, showcase products, educate or entertain your visitors. More on environments. Meet the call of your international show schedule with DisplayWorks as your local partner. We help eliminate the risks and hassles of working with unknown foreign vendors. 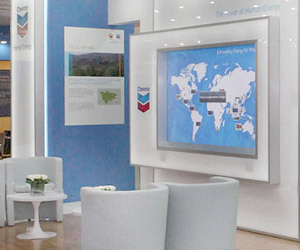 Working with your DisplayWorks account team, we coordinate your exhibit design locally. Next, ensuring nothing is lost in translation, we provide fabrication and fulfillment near your international show venue, with our proven service partners abroad. Digital media is changing the way we communicate on the show floor. Take advantage of the latest in touch screens, interactive product demos and e-literature systems. We make it simple. DisplayWorks stays on the cutting edge of interactive media by constantly evaluating the latest innovations to hit the market. We can recommend the best solution for you, based on your communication needs. 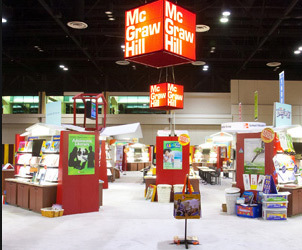 Our team helped McGraw-Hill Education create a show floor environment to promote their new total solution for K-12 and the many reading-based products they offer through various imprints. 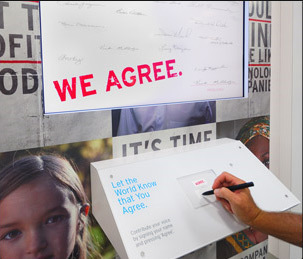 The blending of traditional educational material display and interactive technology was the first step in what is now an ongoing marketing initiative. The concept itself, with an abstract, contemporary school house structure further reinforced the message and the brand. The large theater area with a technology based modern classroom was the ideal element in which to demonstrate their various products. The large graphics and corner units defined the space and created an encapsulated, experiential brand environment. Smith & Nephew, headquartered in the U.K., is one of the fastest growing medical brands in the world. Our Cincinnati team worked with all three major U.S. divisions of the company — Orthopedics, Endoscopy and Wound Management — to create an exciting, unified presence in their 22,000 sq foot exhibit at AAOS in San Diego. 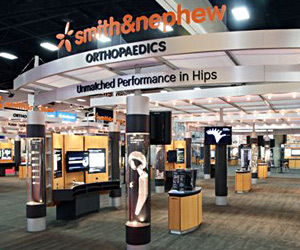 The sprawling two-story exhibit gave Smith & Nephew the ideal environment to engage and educate their audience. Making extensive use of AV and interactive technology the booth came alive from its towering 40’x40′ JumboTron down to personalized touch screens and virtual product demonstrations spaced throughout the floor.